Studies of European mistletoe’s host preferences often show distinct preferences for particular varieties, or cultivars, within a tree species – so that some varieties of Apple tree are more susceptible than others, as are some varieties of Lime tree, Poplar tree etc. Demonstrating this convincingly on the ground is difficult – as you generally need a lot of data for lots of trees. Some background: We live on the edge of Stonehouse, not far from the old Standish Hospital, a rural former NHS hospital now standing empty and decaying in its own grounds – which are a mini-arboretum, with many splendid exotic mature trees. The driveway up to the site has an avenue of relatively young (maybe 30-40 years old) ornamental maples. Now, we’ve been here over 14 years now, and have walked that drive regularly, as there’s a bridleway route though the site. And over those years we’ve watched as mistletoe has established in those maples, colonising from existing mistletoe colonies in the remnant apple orchards nearby (there’s an old orchard at both ends of the drive) and from mistletoe in nearby poplars. A view of the Standish hospital maples on 29th December – you can just make out that every other tree has mistletoe. The revelation: The mistletoe in the maples is now fairly well established – and on Christmas Day afternoon, as we wandered up the hospital drive and back in an effort to walk off some lunch, I was idly assessing the mistletoe in each tree (as one does) – and suddenly realised that… every other tree in each side of the avenue was mistletoe-free. 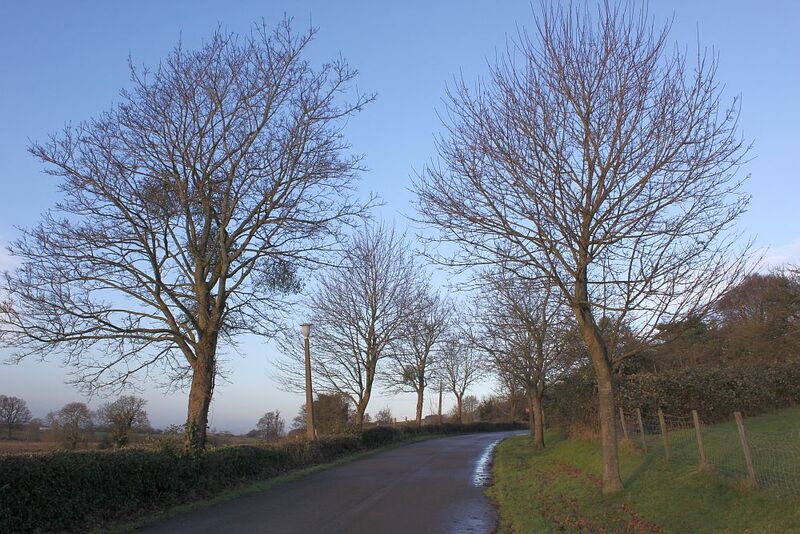 And the mistletoe-free trees were never opposite across the avenue either. 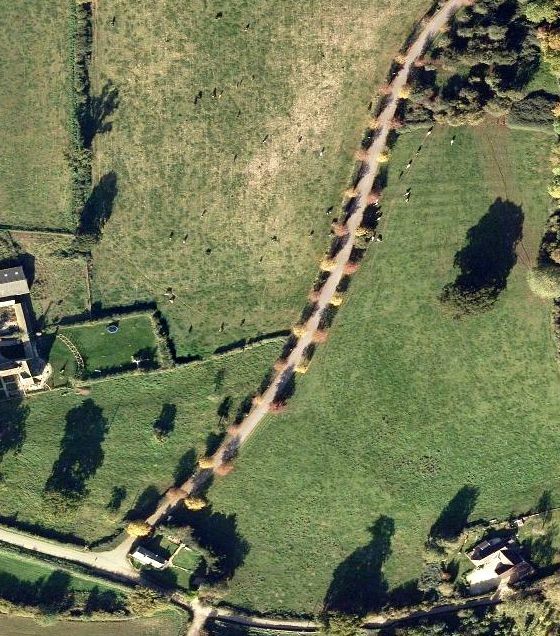 So, if plotted on a map the mistletoe trees would be a zig zag pattern along the drive. And why would that be? Well, these maple trees are two varieties – one a red-leaved one and one a green-leaved one – and they are planted in an alternating pattern. So… the mistletoe, which we’ve witnessed developing over the last 14 years, is only colonising one of the maple varieties – not the other. Which one? Well I think it is the red-leaved one – but will have to wait until spring for confirmation. The aerial photo on the right, when compared to the mistletoe pattern we’ve seen (we checked it again today), seems to confirm red though. So, there you have it – mistletoe colonising one variety of a tree but not another closely related one – despite having decades to do it in and the trees being right next to each other. I’m just slightly embarrassed that I’ve only just noticed! A little Book About Mistletoe is ON PROMOTION at Amazon – currently reduced in the print and Kindle versions – Kindle version is 99p for just the next few days! Click HERE! And try The English Mistletoe Shop for Grow-Kits, Grow-Kit Gift Cards, Books etc, and mistletoe of course. Monty’s at it again! His annual mistletoe misinformation project is reduced to one small paragraph this year, published as usual in that bastion of misinformation, the Daily Mail. 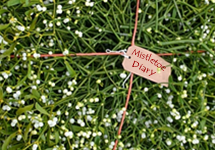 For comment on one of his longer previous efforts have a look at the the Mistletoe Diary for Dec 15th last winter. “Mistletoe is a parasite.” Almost correct – mistletoe is a hemi-parasite, as it produces its own metabolites through photosynthesis, just like non-parasites. “The seed is deposited on the bark of a host tree and puts its root into the branch, tapping into its nutrients.” Yes the seed is deposited on the tree’s bark but it doesn’t have ‘roots’ and doesn’t grow ‘into’ the branch – it just penetrates the bark and make the tree’s growth cells grow around it. The only nutrients it takes are from the tree’s xylem system, which is just water and minerals from the soil, not the tree’s own metabolites. “As the mistletoe grows outwards its roots are growing inwards.” See comments above – mistletoe does not have roots – and does NOT grow inwards – it makes the host grow outwards around it… (and so creates an illusion that it grows inwards – which is a remarkable phenomenon and surely worth mentioning Monty? ). “Eventually these block the tree’s nutrient supply and the branch dies, killing its parasite with it.” No (see comments above) – though the branch and tree will be much stressed by the mistletoe and too many mistletoes will hasten tree death. For more on the actual mechanisms Monty might try actually reading it up – he could start with some of the info I reviewed here recently on mistletoe and tree mortality – it’s absolutely fascinating stuff and, again, surely worth covering truthfully Monty?? “Mistletoe loves apples, hawthorn and poplar, but no one knows why it grows in some places and not others, although air quality and humidity seem to be important, as does the migration pattern of birds such as blackcaps that excrete the seed onto suitable branches.” Where to start with this one?? Yes the tree list is accurate, but reasons why it grows where it grows are fairly well understood (though obviously not by Monty) and have nothing to do with air quality (is he getting it confused with lichens???) and whilst blackcaps have a role, their winter role in Britain is only recent, in the last few decades, so is most definitely NOT the reason for mistletoe’s established distribution. And blackcaps wipe the berry – they don’t excrete it. That might seem a minor point but it’s not – it is fundamentally important to how new winter populations of blackcaps might be gradually changing mistletoe distribution – perhaps the most fascinating mistletoe fact of the moment – which is extremely newsworthy and gardening-relevant – though, sadly, it seems to have passed by Monty entirely. As I said last year, though not in these words, how does he gets paid for this tripe? If it was written by a non-specialist it would be forgivable – but such inaccurate info from a ‘gardening expert’ is not, in my view, acceptable. A Little Book About Mistletoe is on promotion! 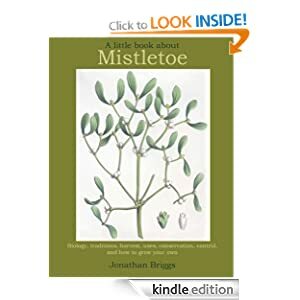 A Little Book About Mistletoe is on promotion at Amazon! In both the paperback and Kindle versions. Kindle version is just 99p for the next 2 days! Mistletoe and candles – I’ve discussed this before, and as my regular reader knows, have no truck with any of those ‘mistletoe-scented’ affairs – which are all fakes, as mistletoe doesn’t have a scent. For previous diatribes see relevant blog entries from 2011 here and 2010 here. But earlier this year the Mistletoe Shop was approached by Lesley Sparks, of The Hedgewitches Garden, who wanted to produce mistletoe candles and melts, and needed to obtain some mistletoe out of season for their manufacture. Did she know it was scentless? Yes she did, and was more interested in incorporating mistletoe into the product, rather than any supposed scent. Her aim was to ‘celebrate the magic & mystical influence of Mistletoe’ by incorporating leaf fragements in the wax – the scent was to come from other ingredients. 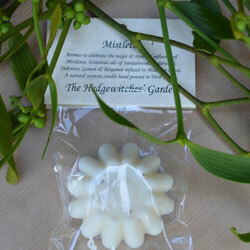 Lesley recently sent me some of the mistletoe melts to try (thanks Lesley). And we have tried them and can confirm that they are beautifully-scented – with a mixture of Sandalwood, Cedarwood, Oakmoss, Lemon & Bergamot. The mistletoe is visible as leaf fragments. There’s a candle version too. So, at last, an honest mistletoe candle/melt – mistletoe-branded but not pretending to be mistletoe-scented! The Sandalwood scent is a particularly nice touch, though I’m not sure whether it is deliberate. Why? Because sandalwood and mistletoe are quite closely related. Our mistletoe Viscum album is in the botanical family Viscaceae, which is part of the wider botanical order Santalales. And that includes the Santalaceae or Sandalwood family. Indeed recent taxonomic opinions have lumped the Viscaceae within the Santalaceae family – meaning the two plants are now considered to be more closely related than previously believed. So a Sandalwood-scented candle is particularly appropriate for a mistletoe-theme. For more on Lesley’s candles visit The Hedgewitches Garden. Plenty of stuff yet to come for the Mistletoe Diary this year – though I’m a bit behind schedule. Time for some light relief from San Francisco, where “interactive artists” (what does that actually mean?) George Zisiadis and Mustafa Khan have made a Mistletoe Drone out of a Parrot AR.Drone (pictured in unaltered form on the right). 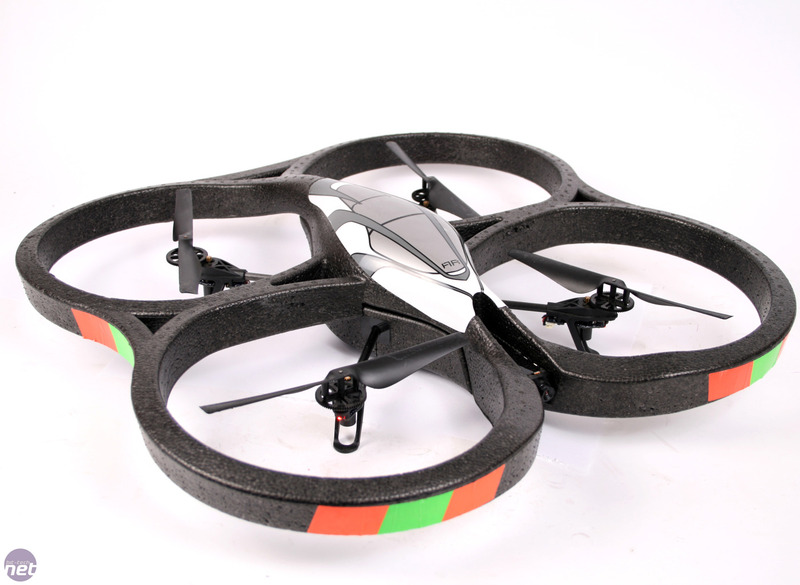 They wrapped their drone in tinsel and mistletoe and have taken it to Union Square in San Francisco to buzz unsuspecting couples. “Buy British!” That slogan doesn’t have the same ring about it these days, when so many products are imported, but surely mistletoe is one of those few that we could, in theory, realistically aspire to buy locally. There are regular calls each year to make sure your mistletoe is British, backed up with the idea that this will sustain our native mistletoe industry. But is this at all realistic? There is no labelling scheme – so, frankly, most florists/greengrocers won’t have a clue where their mistletoe came from. The only significant home-grown supply is from mistletoe-filled orchards in the SW midlands of England – and those orchards are on the decline. 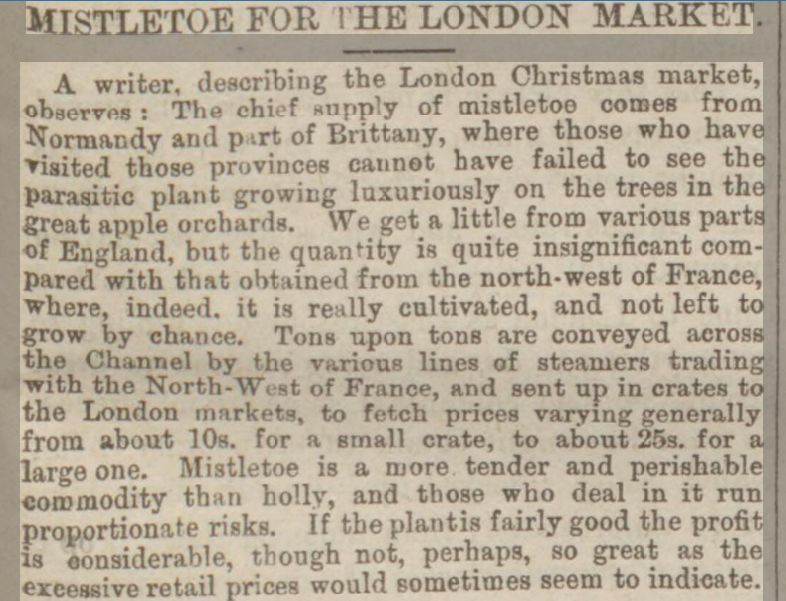 And, despite media-hype, we have relied on mistletoe imports from mainland Europe since at least the late 19th century. 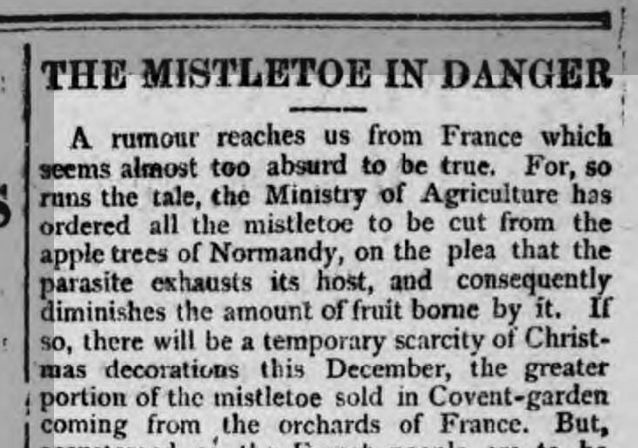 A report from the Worcestershire Chronicle in December 1884 – note that despite being a Worcestershire paper it expresses no surprise that most mistletoe comes from France!! Are those imports a problem? Not as far as I can tell. Up until the 1960s or so, when imports still came via traditional means, it was normal for the British media to report on the import figures – with tonnages of mistletoe imports reported as a ‘good thing’ and part of the Christmas seasonal events. Since the 1990s, when worries about home-grown mistletoe supplies began, the opposite line has been taken – with the media implying that imports are somehow bad, and a ‘new’ phenomenon. Press photos from the 1920s, 30s and 50s feature Normandy farmers cutting mistletoe for export to Britain. It was an accepted, and expected, part of the seasonal news. The import trade continues, though it’s not so well reported these days, perhaps because there is so little regulation on cross-border trade now, particularly within the EU. This makes it much less obvious. But should we be worried by it – do mistletoe imports threaten our home-grown mistletoe trade and harvest? I suspect there is no problem – indeed the recent trend to publicly despair of imports is probably ensuring the home-grown trade is doing better than ever, especially with the new UK-branded mail-order retailers set up on the internet (which are the only effort at a ‘Terroir‘ system we have for mistletoe). The real problem is sustainability – and that applies to both the home-grown and imported mistletoe. Most mistletoe, wherever it is harvested, comes from old-style traditional apple orchards and those are just as threatened in mainland Europe as they are in the UK! As she stood beneath the mistletoe. ho-ho, ho-ho!! When Mr Bieber’s ‘Mistletoe‘ song charted a couple of years I despaired. It was worse than Biff Pilchard’s ‘Mistletoe and Wine‘ (and it messed up every search engine’s responses to the word ‘mistletoe’ for ever!). News reports this week reveal that Pilchard’s version of Mistletoe and Wine is an over-sentimentalised version of a more politically-motivated original. And the original was part of a 1987 musical version of A Little Match Girl. You can watch a version of that here. This information is some comfort I suppose. But it did make me wonder – would we ever get a decent mistletoe-themed song at Christmas? And then I remembered… we already had it! Way back in 1974. It was the B-side of The Inbetweenies by The Goodies . “Father Christmas Do Not Touch Me“. (actually briefly the A-side as they swapped it round in November 1974, just to confuse us). A classic – but probably politically-unacceptable due to its innuendo and improper suggestiveness these days. If you can’t remember it, here it is…. Confessions of a teenager: I remember discussing the song (and singing it too) at the tender age of 13 and 3 quarters, with my good friend Julian Goodwin (now a respectable member of staff at the School of Engineering & Physical Sciences at Heriot-Watt University – complete with slightly scary picture).